With the thrill of festive celebrations drawing closer, and the shopping excitement undoubtedly contagious, Taneira held its first ever Tales of Tussar Saree Festival from the 20th to the 30th of September 2018. The only silk that is indigenous to India, Tussar is a homegrown fabric, with the unique property of being suited to all weather conditions and occasions. Considered to be one of the most versatile fabrics, the easiest to drape with the best fall, Tussar is used in sarees across India. Taneira’s Tales of Tussar combined diverse workmanships from different parts of the country, myriad colours and spectacular patterns to make Tussar the perfect backdrop for festive ensembles. Customers’ favourite from the festival was Taneira’s cutwork collection on handwoven Tussars. A delectable palette of colours, these Tussars featured delicate borders and magnificent pallus, with intricately embroidered designs. From wild rose bushes to singing sparrows, the warm oranges, deep purples, bright blues and dainty pastels of this collection implored to be worn to a daytime Pooja or glamorous cocktail. Accented with statement danglers and a solid silk blouse, these cutwork Tussars were truly the epitome of grace. Customers’ second pick was the appliqué Tussar collection, made in Rajasthan. 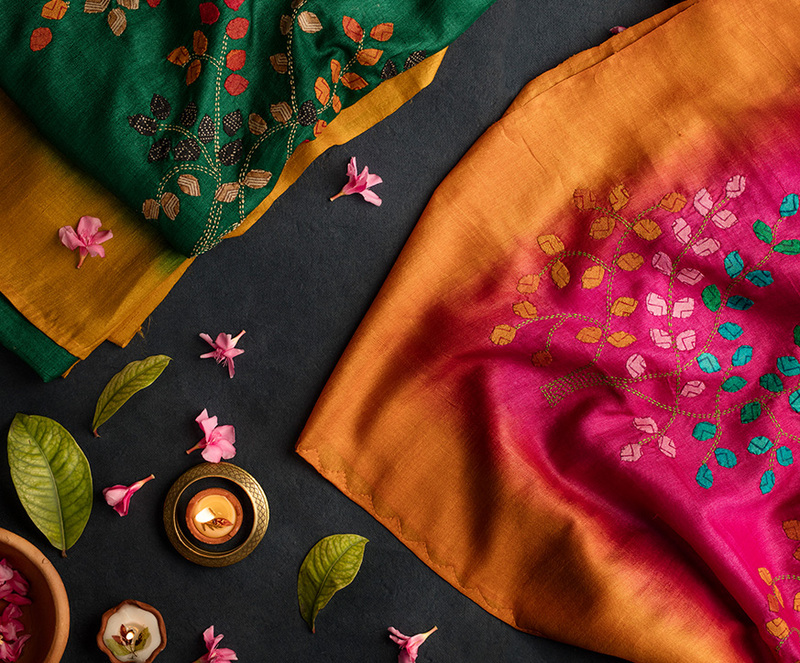 With vivid contrast borders and a bright smattering of appliqué across the pallu, this was inspired by the popular motif of the Tree of Life. Signifying the seamless beauty and interconnectedness of nature and life, this motif was the highlight of these Tussars. An Ajrakh crop top and chunky silver jewellery made this a chic choice for the Pujo season. Customers were also thrilled to find an exclusive set of Banarasi Tussars, rich with Mughal butas and floral contrast borders. Rich metallic hues and dull gold zari made these Tussars a grand addition, especially those with meenakari (multicolour thread work). Taneira’s Bhagalpur Tussars have always fed a limitless appetite for sarees; this time’s collection showcasing bright festive colours with dramatic broad borders and placements! Perfect for the festive season, these sarees were especially grand when partnered with metallic tissue blouses. Glamour all the way! Taneira’s Tales of Tussar was a glorious array and quite easily, the widest range of Tussars put together by a brand so far. It was a sheer joy to browse, ooh and aah over every piece; the warm glow and natural sheen of Tussar was far too alluring to resist. There was plenty to discover at the Festival; enthralling tales of Tussar, the tempting display and a memorable tour of India’s Tussar trail. This festive collection one was truly one to remember!